Tonight (Friday, Sept. 23), the famously inventive singer/composer Theo Bleckmann comes to town, thanks to Macalester College. I totally forgot to mention this on the air with Ed Jones this morning; smacking self now. I've been looking forward to Bleckmann's performance ever since learning about it in late August. He'll do a solo show at Macalester-Plymouth United Church--no band, just Bleckmann and his array of low- and high-tech toys. Here he is singing Kate Bush's "And Dream of Sheep." I do hope he sings some Kate Bush. 1685 Lincoln Ave., St. Paul, one block south of Grand, one block west of Snelling, adjacent to the Macalester campus. 8 p.m. Free. A new monthly jazz concert series starts on Saturday, with a bonus. Jazz at Studio Z, curated by guitarist Zacc Harris, features large-ish ensembles starting with the Dave King Trucking Company: King on drums, Eric Fratzke on guitar, Brandon Wozniak on saxophone, Adam Linz on bass. The concert starts at 7 in Studio Z in the Northwestern Building in St. Paul’s Lowertown. The bonus is an afternoon workshop earlier that day—a rehearsal of what the band will be playing that night, free and open to the public. People will be able to ask questions and get an insider’s perspective on the music. That starts at 1 p.m. Concert $10, rehearsal free. Another series is underway in St. Paul, at the Khyber Pass Café. Owner Emel Sherzad has long been a huge supporter of improvised music in the Twin Cities. Now many musicians are giving back by performing at a series of fundraisers to help the cafe through rough times. Tonight (Friday): Davu Seru and Dean Magraw. On Saturday, Merciless Ghost, with George Cartwright, Josh Granowski, and Davu Seru. On Sunday, Charcoal with Anthony Cox, Milo Fine, and Davu Seru. The music starts at 9 every night on Grand Ave. in St. Paul. Go online to check the schedule, and please come prepared to make a donation. 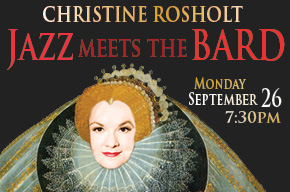 On Monday, vocalist Christine Rosholt presents a program of Shakespeare sonnets and poems set to compositions by John Dankworth, Duke Ellington, Billy Strayhorn, and Arthur Young. I saw the original version of Christine’s Shakespeare show a few years back and enjoyed it immensely. She's a terrific entertainer with a fabulous band: Tanner Taylor on piano, Graydon Peterson on bass, Jay Epstein on drums, Dave Jensen on trumpet and flugelhorn, and the legendary Dave Karr on sax and clarinet. See and hear them jazz the Bard at the Jungle Theater on Monday starting at 7:30 ($25). Nice coincidence: the Jungle's current production is Hamlet.